The XP10 is a controller for digital DJs, with a “high precision” wheel for cueing and scratching similar to those found on many scratchable DJ CD players. 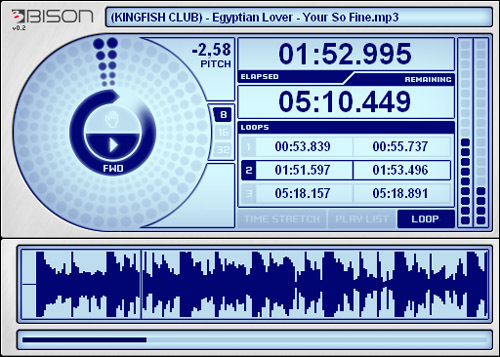 Coupled with the included Bison software for your computer, it can act as a DJ mixer for MP3s, with OGG support in the works. (Currently, the software only runs on Windows, but Mac compatibility is planned.) It’s also a high-quality audio interface, with a 105dB signal-to-noise ratio. Why should you care? For starters, we’ve got some glowing endorsements from a reader, Ludovic Llorca. 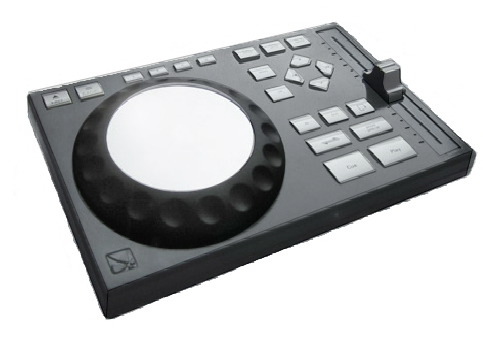 But better yet, the creator is working on a MIDI driver, meaning this could be a perfect controller for VJing and other applications, as well. Retail: 330 EURO (not bad at all, particularly if the feel is as good as promised). That could fill a niche for mid-range controllers, an area that’s currently pretty quiet. Ludovic’s comments on testing the device plus a grab from the software, after the jump. I’m DJ and I’ve been testing for a couple of months a new product called the XP10. It’s a controller + soundcard for digital DJs. For the moment, it’s only working with Bison (the free MP3 player that comes with the hardware) but MIDI drivers will be released this month, so you can use it with Traktor, MixVibes, etc. The Bison software is still a beta but the 0.9 version will be released this month, as well, with a time stretch option. I really want people to know this thing; I fell in love with it as soon as i got my hands on it. The feeling is very similar to the Pioneer CDJ touch, and the scratch wheel is amazing. It behaves like a CD player. You have to buy and connect 2 XP10s to your computer if you want to DJ. The Bison software plays MP3 files (any bitrate), and the sound is excellent. It was invented by a Finnish guy (I’ve been told he used to work for NOKIA), who finally started his own company “EKS” to manufacture his baby, and it’s distributed by a French company called “R-Digital”, build by a very young guy. I want to add that, even though Bison looks very simple, I find it more intuitive and clear than all the others software. You don’t even need a mouse to choose the tracks, as you can do it with the controllers. Feels like a Phillips CDJ, but costs EUR300 and supports MIDI? Where can I sign up again?